As we ring in 2019, there are plenty of resolutions being made and likely already broken. 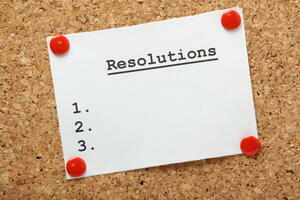 Inc. Magazine’s list of the ten most common resolutions doesn’t contain too many surprises. Prioritizing health and fitness through diet and exercise, spending quality time with friends and family, and other self improvement plans are on many people’s minds. Endless how-to articles and listicles are published this time of year to motivate and inspire individuals to stick with their resolutions.